I’ve been getting quite a few questions about my use of the NIBE Uplink API for monitoring my NIBE heat pump installation so this Page is a simple HOWTO guide for using a Perl script running on Linux to grab data via the NIBE Uplink API. This procedure works for me and I’m publishing it here as a Proof of Concept in case it helps other people trying to accomplish the same objective. It may not work for you. It may not get updated in line with changes to the NIBE Uplink API service. You are responsible for complying with the terms of the NIBE Uplink API Services Agreement and for keeping the application Identifier, Secret and any generated user Tokens confidential. I have an 8kW NIBE F1145 Ground Source Heat Pump which is configured to send data to the NIBE Uplink service over the Internet. The uploaded data is accessible via the NIBE Uplink website and via the NIBE Uplink smartphone apps, but those apps use the API under the covers and it’s possible to call the API directly from a custom program or script to access all the same data – and then do more interesting things with it. I have written a script which is called on a timed schedule (every 5 minutes) to download the parameters I’m interested in which I then re-publish using MQTT (my personal preference; in no sense essential) to integrate them with temperature data from other sources (Dallas Semiconductor One-Wire sensors and Oregon Scientific temperature / humidity sensors – see other pages on this Blog for more details of those if you’re interested). Everything then gets loaded into an InfluxDB time-series database from which it can be extracted and graphed with Grafana (again my personal preferences but they work well for me). 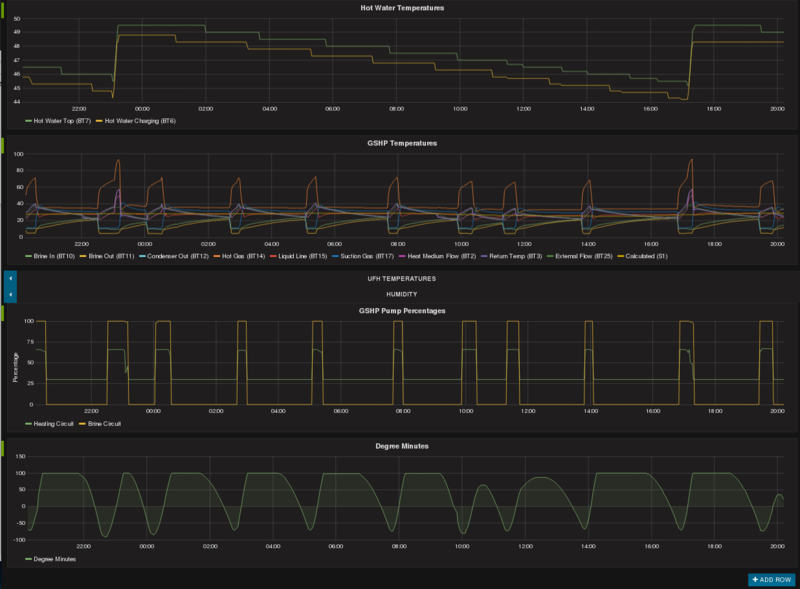 An example of the sort of dashboard generated by Grafana is shown below but to be honest a static screenshot doesn’t do it justice since hovering over any of the graphs displays the numeric data values and clicking on one or more of the labels in a legend shows just those lines (and auto-scales to suit). Scrolling left and right across different time periods and zooming in and out is also easy and slick. A NIBE Uplink account with at least one heat pump registered to it and reporting data which is viewable via the website or one of the smartphone apps. 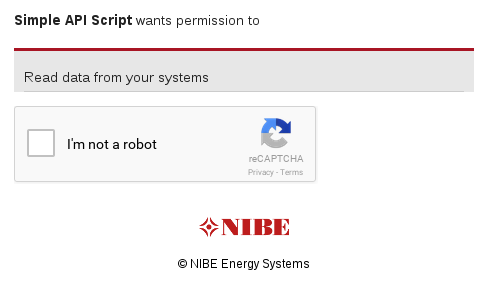 Anyone can use the “Register an account” button on the main NIBE Uplink page to create an account if you don’t have one, but unless you have a heat pump linked to the account the API won’t return any data. A Linux computer which is able to access the Internet and which will run the Perl script to download data via the API. It doesn’t need to be particularly powerful – a Raspberry Pi or similar single-board-computer would be adequate. It could also be a small Virtual Server (tested successfully with a Microsoft Azure Public Cloud ‘Basic_A1’ size of virtual server). It doesn’t need to run a web browser or have a graphical display attached – remote access via a terminal window using a tool like PuTTY or ‘ssh’ is sufficient. Since this Page is about the NIBE Uplink API and not about installing or configuring Linux or Perl, I’m going to declare that you should use a Linux distribution which has the Perl LWP::Authen::OAuth2 Module available as a standard operating system Package. This is true of Ubuntu Server 16.10, for example (where the package is called ‘liblwp-authen-oauth2-perl’). If you are familiar with Linux and Perl then go ahead and grab the source code for LWP::Authen::OAuth2 and install it on a Linux distribution of your choosing. I have it working fine on Raspbian Jessie Lite on a Raspberry Pi Model B, but I’m not going to document the somewhat lengthy procedure required to achieve that. An Internet-connected computer with a standard graphical web browser (Firefox, Internet Explorer, Safari etc.) which can be used to complete Steps 1 and 2 in the procedure described below. This can be any platform you like – potentially even a Smartphone – and certainly could be the same Linux computer described at Item 2 above if that meets the requirements, though typically it will be a different machine. If the computer running the browser is not the same as the one running the script, then ensure you can connect to the computer running the script, since you will need to copy-and-paste a long text string between the two, accurately and quickly. A basic knowledge of the Perl scripting language, editing files and installing software packages on Linux. I used Perl because that’s what I’m most familiar with and it has some add-on modules which help with much of the necessary processing. Alternatives such as PHP, Java or similar can probably be made to work too if that’s what you prefer. The Perl module LWP::Authen::OAuth2 is used to hide a lot of the complexity of OAuth2. There’s a good documentation page for that at http://search.cpan.org/dist/LWP-Authen-OAuth2/lib/LWP/Authen/OAuth2/Overview.pod though in principle if you exactly follow the procedure outlined below you don’t need to understand how it works. The computer which will run the script that calls the NIBE Uplink API needs some preparation to ensure the necessary supporting Perl modules are available. The following assumes it is running Ubuntu Server (or Desktop) 16.10, for the reasons described above. Amend the scripts below if for some reason this is not as shown. Start by Registering the new Application you will be creating at the NIBE Uplink website so that you get allocated your various unique ID strings which will be required later. Record the allocated Identifier and Secret strings and keep them secret! Next, use your Identifier at the NIBE Uplink Authorize Endpoint to get an Authorization Code which relates to your usage (as an end-user) of your application (as a developer). The state should really be a random string that only you know and can verify when you see the same string returned, but hard-coding that as the fixed string ‘STATE’ doesn’t hurt for now. The state parameter does appear to be mandatory for NIBE Uplink API calls. That value for Parameter ‘code’ (pixelized in the screenshot) is your Authorization Code which you’ll need to copy-and-paste at Step 3 – before it expires. Most likely you’ll need to re-run this step to get a new code once you’ve prepared Step 3. Switching now to the Linux computer which will be running your script, you need to create a Perl script which will use the Authorization Code in conjunction with other details (in particular the Identifier and Secret allocated previously) to request an Access Token which can then actually be used when calling the NIBE Uplink API. If everything worked perfectly you will see no output text and you will find you have a new dot-file in your Home Directory called “.NIBE_Uplink_API_Tokens.json” containing the Access Token and an accompanying Refresh Token, serialized using JSON syntax. Note that it typically takes several seconds for the Tokens to be issued – the same delay is evident when using the Smartphone apps. OAuth2 error: invalid_request at ./request_tokens.pl line 30. Now we have an Access Token we can actually call the API, and now things are less time-critical because the Token will be automatically renewed as required. That simple line $response = $oauth2->get( $url ); is doing most of the work here. Under the covers it’s taking care of presenting the Access Token when making the API call, checking whether the Token has expired and automatically renewing it if necessary. Whenever it gets renewed the new Token gets written back to the .json file so it is available for next time. Some people have asked for examples of the JSON strings that are returned in response to the NIBE Uplink API calls. I’ve replaced strings like the serial number of my heat pump and my postal address details with XXXXXX’s but otherwise the responses are exactly as returned. If this procedure works for you, great! Please leave a Comment to let me know. If it doesn’t work or doesn’t makes sense please also leave a Comment and I’ll try to help. Clearly just printing out the systemIds isn’t very interesting but the NIBE Uplink API Documentation describes the other API calls in some detail. A slightly sanitized version of the script I actually use can be downloaded from here. Note it has dependencies on further Perl modules and won’t work without other pre-requisites being satisfied. However, it does provide examples of calling some of the other NIBE Uplink APIs and how to extract the details from the slightly convoluted nested data structures. NIBE Heat Pump Monitoring via NIBE Uplink API by Marsh Flatts Farm Self Build Diary is licensed under a Creative Commons Attribution-ShareAlike 4.0 International License. Great Article thanks for sharing. Can you also share the PHP code for the Callback (https://www.marshflattsfarm.org.uk/nibeuplink/oauth2callback/index.php)? Thanks for the feedback; I *knew* there was something else I had meant to add to the article but I’d forgotten it was to do exactly that. PHP script source now added to the body of the article. First of all, nice work, very interesting and I have learned a lot from it. Unfortunately I have not yet any Nibe geothermal heat pump, but plan to buy one. I’m trying to do the very same as you but in my case I will use Java. So my question is, if it will be possible for you to just send me some info. about the actual JSON respons that you use in your script. If I do have the JSON syntax will it be possible for me to do some coding before I have my very own pump and regarding to that also access to my own account. I see that you have an F1145, I’m quit not sure yet which model that will be the best for me, but I assume that they have similar syntax regarding JSON-respons. For the record, I’ve exchanged a few emails with Örjan and discovered they’re planning to develop a NIBE heat pump binding for the OpenHAB home automation framework, which I also use. I’ve also added some JSON Response Formats examples within the body of this Page. Just to fill in with another work going on if more people find think link when searching for NIBE API, which I did =). There is now a working custom component to http://www.homeassistant.io that was done by elupus (https://github.com/elupus) that works great! Everything you get from NIBEs App you can now see in your Home Assistant setup. we need to know if we need to pay yearly fee for using the API and NIBE Uplink. No, there is no yearly fee. You just need to register an account, for free. Yearly fees only apply if you want to Manage the heat pump remotely (e.g. to change the temperature settings) or to access History (i.e. old data) via the NIBE Uplink website. By storing the data in my own database I can use that to access old data. I was just reading your piece on using the Immersun system with your Mibe F1145 heat pump. I have the same heat pump and wish to ista an Immersun system to divert my solar power energy to the immersion for free hot water, however I have just contacted Nibe who advise that I can not use an Immersun to that heat pump. Do you have any info on how you connected yours and hows it working now? So yes, I have a NIBE F1145 and yes, I have an ImmerSUN unit – but they’re separate. The immersion heater for the ImmerSUN is part of my 200 litre hot water storage cylinder. There is another immersion heater which is incorporated into the F1145 but that is not connected to the ImmerSUN unit. I don’t believe there’s any way to connect or control that separately, which matches what you’ve been told by NIBE. My F1145 and my ImmerSUN work well together because the immersion heater (in the hot water cylinder) has its thermostat set to 60 degrees. Normally that takes care of all the hot water. Only when the stored hot water is cooler than 50 degrees at 05:00 does the F1145 kick it and heat the water. Many thanks for taking the time to reply David. That is one of my biggest regrets with the system. Going for the all in one box limits what you other energy sources you can feed in. That being said, we are spending about half the price of oil heating the tank for a family of 4.
finaly i could make it to run. do you have ever heart of iobroker? i would like to get the parameters of the nibe into the iobroker. do you now someone or can you maybe help me witth my problem? both run on the same raspberryPi. First of all, thanks for the sharing of information – really useful! Could you elaborate on the reCaptcha / Authorization code portion and how you handle it in your environment? Do i inturpret you correctly where you basically obtain the code once, then always use the token from that part on? I am developing an UWP/C# (not always turned on – as in IOT scenarios) app running in a “kiosk” scenario – where restarts would have to be handled, prolonged over the 1800 seconds the token lasts – making it hard to “authorize” the app / user each time the applicatio is fired? Thanks in adnvance! Authorization is a one-time thing. There are effectively 2 separate tokens issued at the time of the initial Authorization: one “current” token and another “renewal” token. The latter can be used to renew the “current” token whenever that expires. I don’t envisage any particular problem with your use case since it matches what I’m doing and I only had to do the manual Authorization once. It sounds like you’re likely to find that the “current” token will have expired whenever you come to re-use it, but you can just use the “renewal” token to get a new one. That aspect of the processing is taken care of by the Perl library I’m using so it’s not something I had ot code for myself.